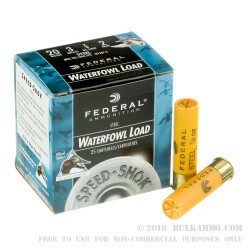 Federal presents their Speed-Shok line of shotgun ammunition to offer top notch performance for a price that won’t leave a sour taste in your mouth. 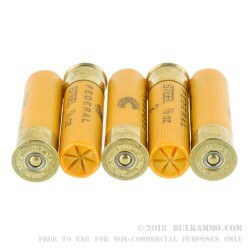 This 20 Gauge shell has uniformly round pellets that provide tight shot patterns. It also features a specially formulated powder for a consistent muzzle velocity of 1,300 fps, and a high density gas sealing flange to make the very most of it. 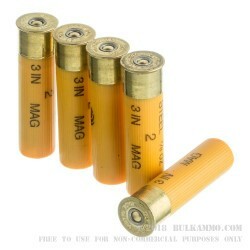 This shell is loaded with ⅞ ounces of #2 steel shot. 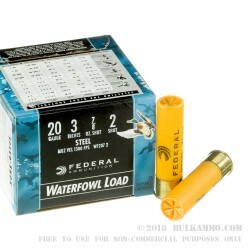 That shot size is perfect for hunting duck and geese, with a nice killzone up to 40 yards, especially if your shotgun is fitted with an improved cylinder, modified, or improved modified muzzle choke. Because this shot is made of steel, it’s totally fine to fire it in protected wetlands. You’ll not only feel a sense of satisfaction that you’re not harming the environment, but also that no game wardens are looming to put a nasty spin on your hunting trip.